During our daily morning huddles, peopled by cardiologists and cardiac surgeons, one thing impresses me more than anything else. The assembled interventional cardiologists, world class and renown, they who can place a stent in any part of the body, will defer to the unassailable superiority of the LIMA to LAD bypass over any existing intervention. I am always a little sad that the analog for this, the vein bypass in the leg does not get the same love. The open surgical bypass of the leg is the great straw man at international symposia. It is fast becoming a diminishing and curious habit of a fading generation. The acknowledged superior hemodynamics and patency of the bypass is diminished in the literature by pooling patency loss with other factors such as amputation, heart attacks, and death. Some vascular surgeons dogmatically cling to habits learned in training that favor complications, making themselves their own worst enemies both in the literature and in the marketplace. These bad habits involve long incision length, closure techniques that do not anticipate edema, and wound orientation that makes failure more likely. Operations require far more support and resources to succeed than do interventions that soon go home. Brilliant operations alone will not heal the patient. It is pathways and postoperative care infrastructure and staff that prevent these secondary complications -the very complications that keep the leg vein bypass from being as respected, if not loved, as the LIMA to LAD. The incisions are too long in the classic vein bypass. When you create and then close an incision, the inflammation drives the accumulation of fluid in the extracellular space – creating edema. This postoperative edema, poorly managed, results in complications that leave the patient hobbled with time lost to healing wound complications, pain, and excess limb weight. Additionally, vein bypasses usually involve groin exposure and the delicate lymphatics that coalesce there are perturbed or destroyed during exposure. Postop, this damage and the inflammation rapidly overcomes the capacity of a lymphatic system. The traditional vein harvest also involves cutting through deep layers of fat. The fat is typically closed by broad sutures that create areas of fat necrosis -potential fodder for bacteria. The best ways the complications of long and deep incisions is to avoid them altogether. The calculus of the operative moment – “I must see the vein,” must include the vision of a patient losing months to wound therapies to heal a gaping, necrotic, infected wound. I recommend skip incisions or adopting in-situ bypass technique with endovascular management of fistulae. Or corral your cardiac PA to harvest the vein segment in the thigh after mobilizing the vein in the leg with the endoscope. The incisions are often closed with Nylon sutures and skin clips which can become potential foci of infection. With edema, they create zones of ischemia around them, killing skin and creating entry points for skin flora as the skin expands under an unyielding clip or suture. Placed under a pannus, these sutures or clips fester in an anaerobic environment. Closure should adhere to anatomy. The body relies on connective tissue planes to keep itself together. In the groin, these are Scarpa’s layer and the dermis. They should be closed with absorbable monofilament in a buried interrupted fashion at the dermis with a final running subcuticular layer of 4-0 absorbable monofilament. Steristrips or glue at the skin finishes the job. If you use sutures, particularly at the distal anastomotic site, take care to realize that you have about 12 hours before the skin dies in the best of circumstances, and less with microangiopathy of diabetes and ESRD. Squeezing out the edema before closure with a sterile Esmarch or short counterincisions or even a large one to allow for tension free closure over an anastomosis will prevent wound complications over your graft. The classic longitudinal groin incisions that cut across the inguinal crease divides a tension point -that crease is like a cord that supports the pannus that is slung over it and when divided and then closed with a stitch, that stitch then bears the weight of that pannus every time the patient sits up or stands. If you are observant, wound necrosis typically starts at the groin crease under a surgical clip or suture. Incisions in the groin should be obqlique and parallel to this crease, or if you can, even inside this crease. When these wounds are closed, the natural lines of tension are in line with the incision rather than orthogonal to it. The natural forces keep the wound shut. This is only the first step. The next is keeping the wound clean and dry for at least 5 days. At the Mayo Clinic, where I trained, the nurses up on 5 Mary Brigh were trained to blow dry the groin wounds every few hours on cool setting and redressing the wound with dry gauze. You can get something close to it by ensuring the wounds painted with betadine, allowed to air dry, and dressed with dry gauze. If there is a constant leak of fluid, you have a serious problem as there is too much edema in the leg, or the wound isn’t closed, or there is a lymph leak. It needs to be actively dried out or you get a wet, macerated, infected wound like a grenade went off in the groin. The simplest thing to avoid lymph leaks is to not make them. Cutting near lymph nodes is hazardous, and once below Scarpa’s you have to orient your dissection directly over the femoral artery. Stray horizontally and you will undoubtedly cut one of the 4 to 10 invisible lymph channels. They are invisible but detectable -after you break them, you will see a constant wetness in the wound. Think about injecting a cc or two of Lymphazurin (Isosulfan Blue, for those not allergic to Sulfa) into the intertriginous space on the same foot and you will see the lymph channel in bright blue, or stare carefully at the likely spots for a lymph leak and clip it, burn it, Ligasure or Harmonic scalpel it. So how did we get to a rather dry discussion about edema? Wound complications are tremendously debilitating and offset any benefit from vein bypass operations. These long incisions become terrible big wounds if not prevented. It takes the concerted effort of a team and particularly nursing in actively managing edema. And at the end, the patient too must be included in this discussion. 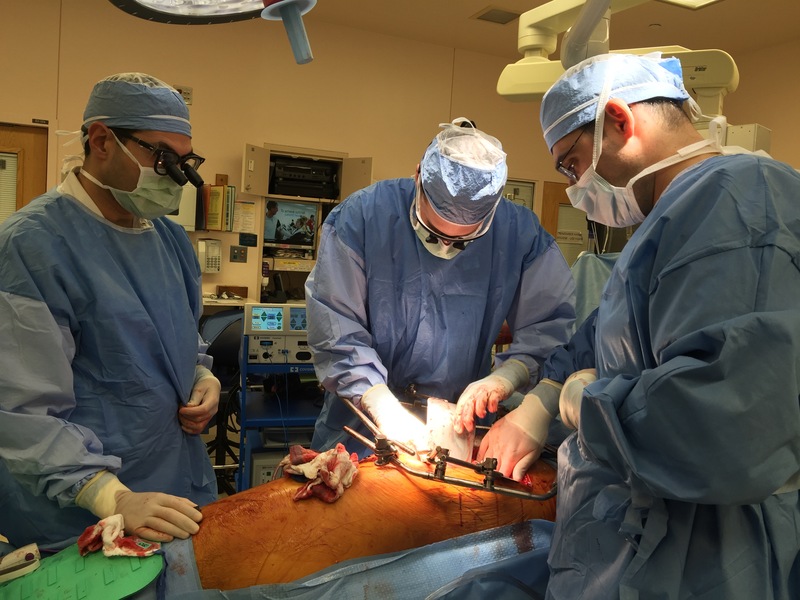 For the vein bypass of the leg to get the same respect and love as the LIMA to LAD bypass, surgical wound complications must become never events. The innovation of sabremetrics in baseball management and finance as described in Michael Lewis’ wonderful book Moneyball wasn’t just the ability to quantify skill to predict outcomes, it was the ability to assemble that skill without overpaying. For a baseball team on a budget, spending all your payroll on a superstar makes no sense when you can get equivalent quants of skill in a statistical aggregate of no-name players with proven metrics. Rather than pay for an A-Rod, you can recruit, and pay for, 5 players that in aggregate, statistically achieve what you would get with a healthy A-Rod, so the thinking goes. How does this translate into vascular surgery? Can we arbitrage complication rates? The open repair of type II thoracoabdominal aortic aneurysms is a heroic endeavor, putatively best done by surgeons wearing cowboy boots, and classically comes with sobering complication rates that exceed 20% for death and paralysis. Is it possible to reduce this risk by subdividing this most enormous of cardiovascular operations into component parts? The patient is a middle aged man in his 50’s who presented with a type B aortic dissection. His dissection flap spanned from his left subclavian artery to the infrarenal aorta. He was a long time smoker and had hypertension that was difficult to control, made much worse after his dissection. He had a moderate dilatation of his thoracic aorta, maximally 36mm and tapering to 35mm in visceral segment. There was a 4.9cm infrarenal AAA where the dissection terminated. His chest pain resolved with blood pressure control and he was discharged, but in followup his thoracic aortic segment grew and his blood pressure worsened, never getting below a 150mmHg systolic despite multiple agents. CTA two months after presentation, showed growth of his TAA to 44mm from 36mm in two months and the visceral segment showed that his dissection flap impinged on flow to the right renal artery. His AAA remained the same. He continued to have bouts of chest pain related to hypertension. Twenty years ago, the board answer would have been to replace the whole aorta. In young, otherwise healthy man who had been working in road construction up to the dissection, he would have been considered a candidate for a direct open repair of the type II thoracoabdominal aortic aneurysm. From the landmark paper out of Houston by Dr. Svensson in 1993, open type II TAAA repair was associated with about a 10% death rate and 30 percent paralysis rate. Waiting a few months for the aneurysms to grow further in this patient, in the 90’s this patient would probably have ended up with an open TAAA repair. Good thing we have better options. The goals of modern therapy are to treat the urgent indication while holding off repair of less critical segments of the aorta, and to do so in a way that each operation builds on the previous one. 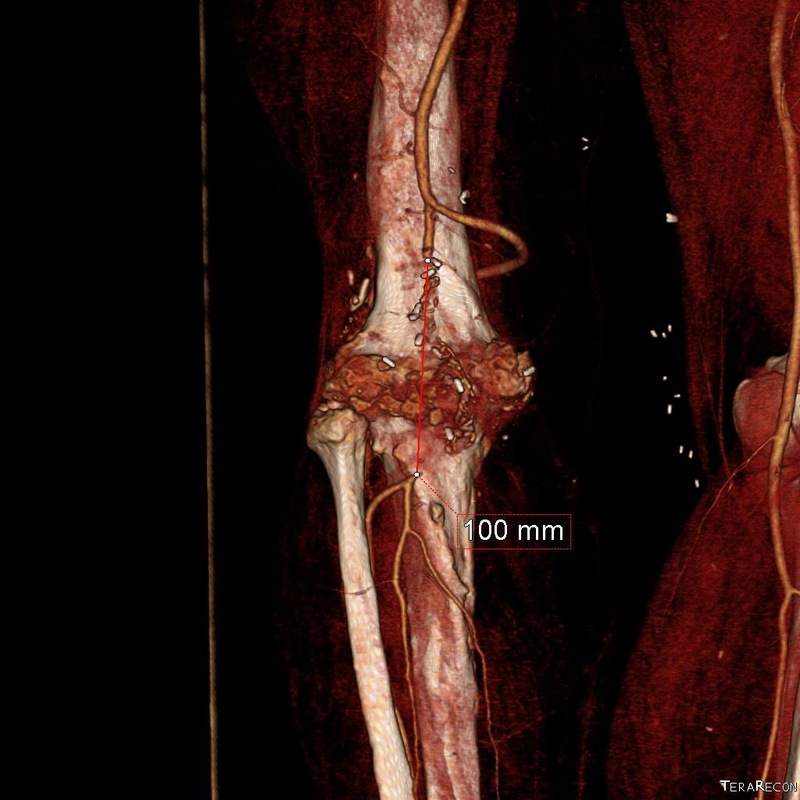 This patient needed a left subclavian artery debranching and then TEVAR of his dissecting thoracic aortic aneurysm, and intervention on his right renal artery. We did this in one setting performing first a left carotid subclavian artery transposition and then percutaneous TEVAR from the left common carotid artery origin to the supraceliac abdominal aorta. The completion aortography showed good deployment of the CTAG device from the left common carotid artery origin to the celiac axis origin. The false lumen was no longer visualized. 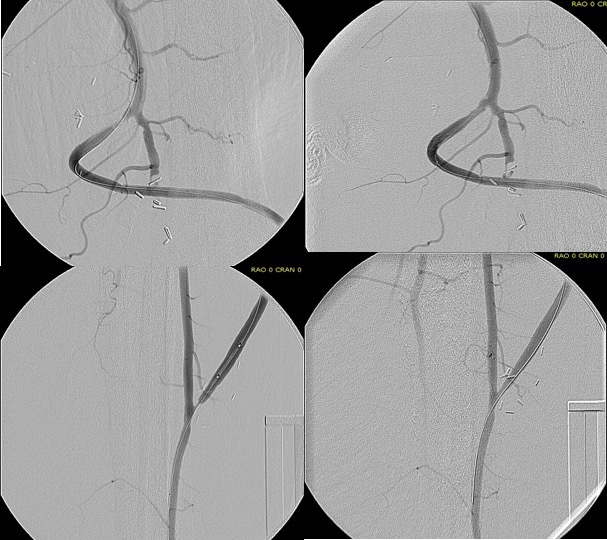 The right renal artery which was narrowed was treated with a balloon expandable stent. The distal thoracic aorta, the true lumen was constrained by a chronic dissection flap. It is here I gently dilate the distal thoracic stent graft with the hopes of eliminating the distal false lumen. This is different from the acute dissection where I rarely balloon. The TEVAR was done percutaneously, minimizing the overall time in the operating room. The technical details of the transposition can be found in the excellent paper by Dr. Mark Morasch. When I do this procedure for acute dissection, I quote the patient a general risk of stroke, paralysis of about 2-5% and death of 1-2 percent for someone with low cardiopulmonary risk like this patient had. He recovered rapidly and went home post op day 5. He at 6 month post TEVAR followup, CTA showed stablility in his thoracic aorta. in infrarenal AAA grew from 5.0 to 5.7cm between the 1 month CT and the 6 month CT. The terminus of the stent graft excluded the false lumen in the thoracic aorta but also resulted in filling and pressurization of the false lumen beyond and can be seen as a 44mm lateral dilation of the visceral segment of the aorta which had developed in the 6 month interval since the TEVAR. The infrarenal neck continued the dissection and had dilated to about 36mm, but was parallel for a good length above the AAA. I decided to treat the inrarenal aorta with direct transabdominal repair. This would allow me to fenestrate the aorta, and possibly prevent further growth of the viseral segment while reserving the retroperitoneum for the visceral segment repair if it came to it. The neck diameter was 36mm. His operation was performed via an anterior approach with the patient supine. A tube graft repair was performed expeditiously and included resecting the dissection flap up to the clamp. Care was taken to avoid injury to the renal stent. The proximal anastomosis went well – the dilated aorta yet had strong tissue strength. A felt strip was used to buttress the aortic side of the anastomosis. The estimated risk of paralysis was less than 1% and risk of death was less than 2%. The patient recovered uneventfully and went home on POD 5. He did well in subsequent followup, having successfully quit smoking. He retired early on disability and was becoming more active, but the visceral segment dilatation was concerning. At 6 months post infrarenal AAA repair, he underwent CTA and it showed patent thoracic stent graft and infrarenal abdominal graft. The intervening visceral segment continued to enlarge and was now 46mm. The decision was to wait another interval 9 months to see if this would stabilize. The segment grew some more and was 49mm. He wanted to give it another 6 months and at that time, CTA showed further growth over 5cm, and he had developed some abdominal discomfort. He was taken to the operating room. A four branch repair of the visceral segment thoracoabdominal aortic aneurysm was performed. The diaphragm was taken down and the stent graft was clamped as was the infrarenal tube graft. A premade Coselli graft was used to bypass to the right renal, SMA, celiac, and left renal in those order. The patient had a CSF drain for the case which was removed on postoperative day 2. He recovered rapidly and went home on postoperative day 6. His estimated risk of paralysis was about 2-5%, mitigated by a protocol centered on CSF drainage and blood pressure control. His risk of death was 5%. Telephone followup reveals the he is pain free at a month out and functional nearly at baseline. This illustrates the notion that three smaller operations in an aggregate over three years achieved the equivalent of the single big open type II TAAA repair. Illustration on left from Svensson et al. The idea is to make each step achievable -like coming down a mountain taking three days on well marked paths rather than base jumping off the summit. Clearly, the patient was younger and a fast healer, and credit must also be given to the anesthesia/critical care team who see high acuity cases in volume every day and not every patient can expect to have such short stays and excellent outcome, but these are far more likely if operations are planned out in such a manner. Svensson LG, Crawford ES, Hess KR, Coselli JS, Safi HJ. Experience with 1509 patients undergoing thoracoabdominal aortic operations. J Vasc Surg 1993;17(2):357-36. The dictum that better is the enemy of good is one of the old chestnuts carried around surgery training forever. It is an admonition against an unhealthy perfectionism that arises from either vanity or self doubt, and in the worse cases, both. The typical scenario is a surgeon trying to make a textbook picture perfect result and finding the patient’s tissues lacking, will take down their work to make it better, and repeat this process while the patient and everyone else in the room lingers. Trying to avoid this, many surgeons will try to avoid any difficulties -the bad patch of scar tissue, irradiated body parts, areas of prior infection. But the mental contortions involved in avoiding “perfect” can result in actual physical contortions that in the end don’t pay off in good enough. I have not been immune to this, and I don’t think any physician or surgeon can honestly say they haven’t experienced some variation on this. 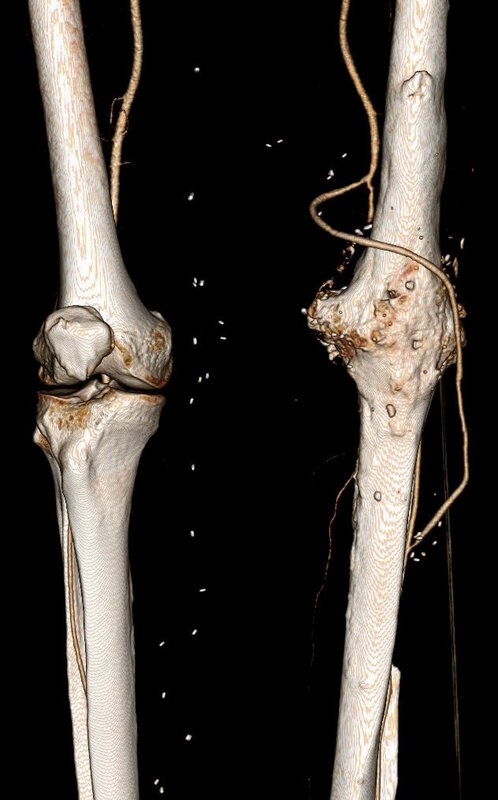 This patient is a younger middle aged man who in his youth experienced a posterior dislocation of his left knee, resulting in an arterial transection. This was repaired with an in-situ graft. Subsequently, he had complications of osteomyelitis and had his knee fused after resection of his joint. He did well with this bypass for several decades, but it finally failed several years ago, and a new one was created (image above). Rather than directing the graft in line as in the previous one, this was was taken from a medial exposure of the femoral artery and tunneled superficially around the fused knee to coil lateral, ending in the anterior tibial artery. This graft in turn thrombosed and was lysed by the outside surgeons and underwent serial interventions of proximal and distal stenoses at the anastomoses. The patient, when I met him, was contemplating an above knee amputation as a path to returning to work as a nurse in a rural hospital. Turning flow sharply can cause harsh turbulence. Turbulence can cause transition of potential energy into kinetic energy which acts to damage intimal, resulting in intimal hyperplasia. Thrombosis is a sure sign that your graft is disadvantaged, and the longer the period of thrombosis, the longer the intima “cooks” in the inflammatory response that accompanies thrombosis, making the vein graft even more vulnerable to subsequent intimal hyperplasia, thrombosis, or stricture. A high flow, small diameter vein graft entering a larger, disease free bed results in more turbulence but also Bernoulli effects that cause the graft to close intermittently, vibrating like one of those party favors that make a Bronx Cheer (a Heimlich valve). This is the cause I think of the distal long segment narrowing on this graft. This patient was decided on amputation when our service was consulted, and after reviewing his CTA, I offered balloon angioplasty as his symptoms were primarily of paresthesia and neuropathic pain. I used cutting balloons and got angiographically satisfactory results. The patient, although he admitted to feeling much better, was sad. He relayed that he had felt this way several times before, only to have his life interrupted by pain and weakness signaling a restenosis. The other interesting finding was that he had an abundance of very good vein. Following surgical dictum, his original and subsequent surgeons had used his vein from his contralateral saphenous vein. His right leg, fused at the knee, lacked a good calf muscle pump action. 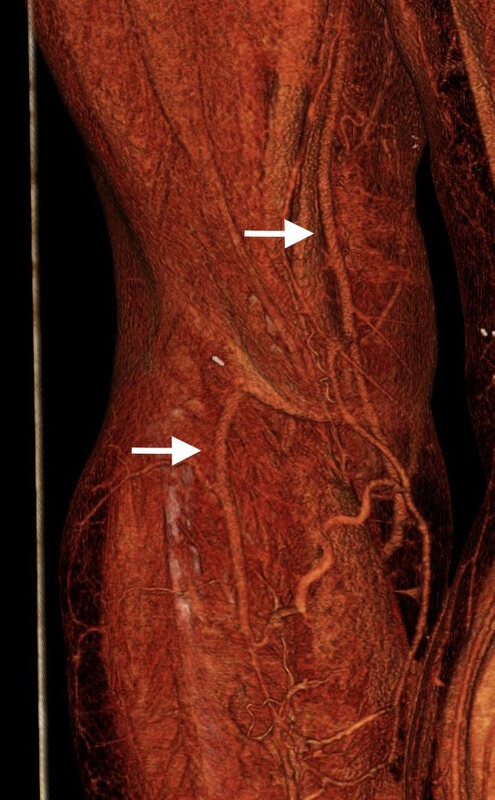 While there were no varicose veins, the greater and lesser saphenous veins were large and generous conduits, at least by 3DVR imagery, confirmed on duplex (image below, white arrows). The extant arteries were smooth and plaque-free. I decided to harvest his lesser saphenous vein and through the same incision expose his distal superficial femoral artery and tibioperoneal trunk. While I anticipated some scarring, I was confident that the sections of artery I wanted to expose were easy to access because of some distance from the fused knee. The picture shows the exposure and reversed vein graft in-situ, using the segment of lesser saphenous vein. As in prior experience in redo surgery, you can never know if a dissection will be easy or hard simply based on fear or concern for breaking something. It’s not until you start bushwacking –carving through scar and dealing with extraneous bleeding will you learn whether it was easy or hard. You can only be certain it was necessary. 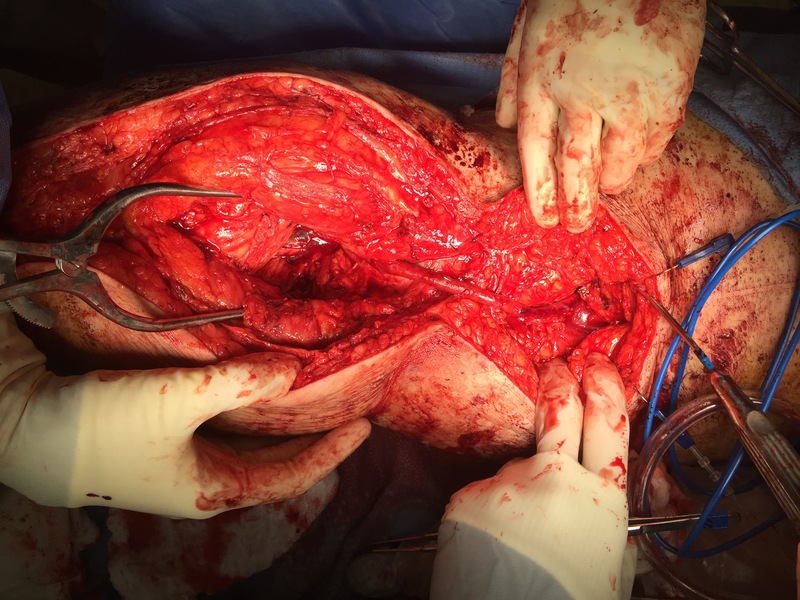 The only hitch was the femoral artery while well exposed, was buried in scar, and I chose not to get circumferential control as I was fairly deep, and had avid backbleeding from a posteriorly oriented collateral that required a mass clamp of the deep tissues. Will this work better? Don’t know but it has a good chance, and I think a better chance. It is a large vein oriented in a straight path over a short distance going from good artery to good artery. This is better theoretically than a long meandering bypass with smaller vein.